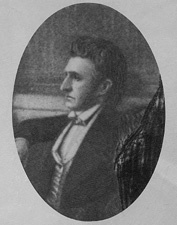 HENDERSON, John, a Senator from Mississippi; born in Cumberland County, N.J., February 28, 1797; a flatboat man on the Mississippi River; studied law; emigrated to Mississippi; admitted to the bar and commenced practice in Woodville, Wilkinson County, Miss. ; brigadier general of State militia; member, State senate 1835-1836; elected as a Whig to the United States Senate and served from March 4, 1839, to March 3, 1845; chairman, Committee on Engrossed Bills (Twenty-sixth Congress), Committee on the Post Office and Post Roads (Twenty-seventh Congress), Committee on Private Land Claims (Twenty-seventh and Twenty-eighth Congresses); resumed the practice of law in New Orleans, La. ; in 1851 was tried in the United States district court in New Orleans for violation of the neutrality laws of 1818 for complicity in expeditions against Cuba, was acquitted, and retired from public life; died in Pass Christian, Miss., September 15, 1857; interment in Live Oak Cemetery. Dictionary of American Biography; Henderson, John. Considerations on the Constitutionality of the Presidents Proclamations. New Orleans: Daily Delta, 1854.